Automated modeling is already in focus by practitioners. However, applications for marketing campaigns require significant effort in data preparation for modeling. To address this bottleneck, the robotic modeler integrates a front layer, which automatically scrolls all executed campaigns and prepares data ready for modeling, with a machine learning engine. It enables for a totally automated cycle of campaign backend modeling, generates a scoring code, and produces supportive documentation. The robotic modeler framework supports generalized deep learning assembling business targets and features. Systematically running the robotic modeler provides additional benefits such as perceiving input feature importance from various campaigns or estimating cross-campaign effects. It empowers “hyper-learning” derived from campaign modeling. Businesses run a significant number of marketing campaigns trying to boost sustainable performance and to increase customer satisfaction and loyalty. In highly competitive environments, it is critical to not only measure post-campaign results, but to also derive the highest level of insight possible in order to support future optimized campaign decisions. 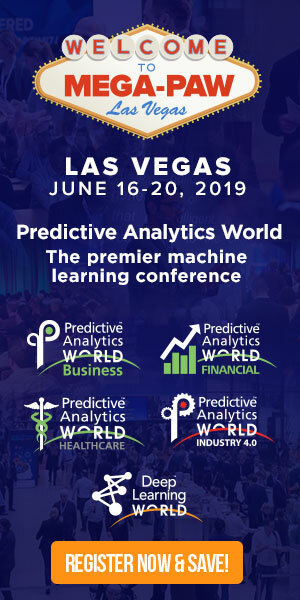 The latest can be done by applying supervised predictive modeling, such as traditional regressions or decision trees, or more sophisticated machine learning techniques including deep learning. Define an appropriate target variable, such as labels identifying responders or revenue figures. Select sources for potentially predictive variables and to engineer input features for modeling. Create a modeling process, which includes a mechanism for validation, parallel training of competing models, and selection of the best one. Fit model, evaluate input features with respect to their importance, and calculate model fit statistics. Produce supportive documentation describing data used for modeling, process, and obtained results. Considering the high volume of the executed campaigns, the standardized and automated approach is the only efficient way to handle business challenges concerning campaign modeling. Automated modeling is already in focus by practitioners. For example, providing data ready for modeling, the “Rapid Predictive Modeling for Customer Intelligence” creates competing models to support targeted campaigns. This approach can address all the requirements stated above except for the first two. However, the business oriented applications, especially for marketing purposes, require a very significant effort to prepare data files for modeling. It is usually a bottleneck. In our case, we enhanced the approach described in Rapid Predictive Modeling for Customer Intelligence, by creating a front automated layer of preparing data that is ready for modeling (Figure 1). This layer automatically scrolls all executed campaigns, selects eligible ones, and then prepares data ready for modeling. The latter is a result of joining target variables and input features that are appropriate for a specific campaign that is eligible for modeling. Most marketing campaigns are targeting acquisition, attrition, sells (cross- sells, up-sells), or customer stimulations. Instead of defining and populating target variables for each campaign, which usually requires significant effort, it is possible to establish a uniformed process compiling all events of interest. It will provide a standardized approach identifying target variables and will support future automation of campaign measurement and modeling. Logically, both the type of campaign and its launch period will drive selection of the appropriate events of interest. Potentially predictive variables for marketing campaigns commonly include customer information and behaviour, product info, and portfolio management actions prior to campaign execution. In addition, the factors of the campaigns’ design of experiment should be incorporated as predictive variables as well. Ones all these predictive variables are extracted and features are engineered, then the process can be reused for different populations and time points. 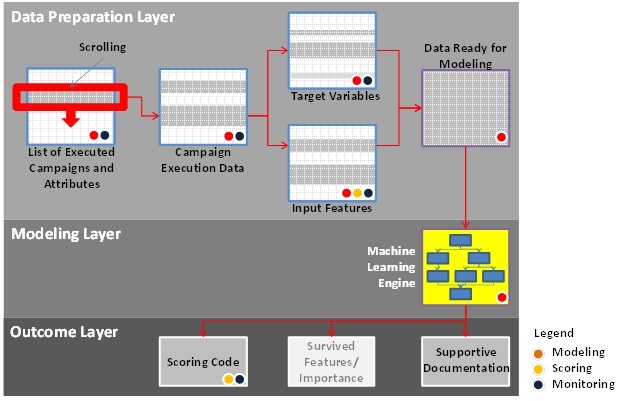 Integration of the described front layer with a machine learning engine enables a totally automated cycle of campaign backend modeling, which includes preparing data ready for modeling, creating and running modeling and validation processes, benchmarking competing models and selecting the best one, generating a scoring code, and producing supportive documentation. In addition, the results of each modeled campaign, such as the modeling process, scoring code, and documentation, are stored with a unique identifier that is linked to the specific campaign. Systematically running the robotic modeler provides additional benefits such as observing the importance of input features from different campaigns, types of best selected models, or estimating the effects of cross-campaigns. It enables “hyper-learning” derived from campaign modeling. Furthermore, the robotic modeler framework supports generalized deep learning assembling business targets and features. Collecting information of these learnings will eventually support shifting from isolated campaign executions towards integrative optimized solutions. Model development on its own is an interim stage of improving business performance and customer satisfaction and loyalty. It is followed by the generated scoring code that is to be used for predicting outcomes and optimizing decisions of future campaigns. In addition, throughout the entire process, monitoring is required to ensure that the developed model performance is still acceptable. Both scoring and monitoring activities can be supported by the robotic modeler in an automated way (see Figure 1). Integrating the automated data preparation layer with an automated modeling engine leads to outstanding robotic modeler performance. It allows for crunching tens, if not hundreds, of marketing campaigns that run monthly and automatically train, validate, and select models within hours if not minutes. Of course, data scientist supervision is still required to assess the obtained results before taking it into production, and to intervene, if necessary. But even if the latter is the case, it means shifting from routine manual tasks of preparing data and crafting modeling processes to more intelligent work of enhancing some input features and tuning hyper-parameters to improve already obtained machine learning results.